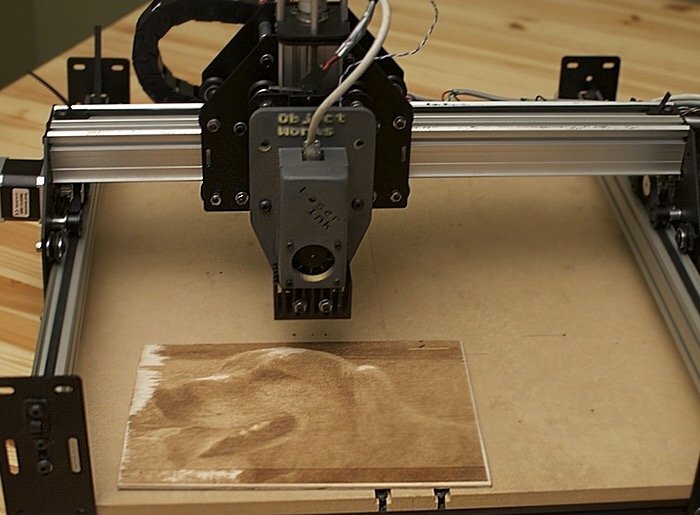 Owners of the awesome Shapeoko 2 open source CNC machine that provides a 12 x 12 x 2.5″ work volume, has this month received new functionality via a new Laser engraving module that is currently over on the Kickstarter crowdfunding website looking to raise $20,000 in funding. The Solid State Laser engraving attachment has been specifically designed to fit the Shapeoko 2 CNC machine and provides both laser cutting and engraving functionality, with software support for photographs and images. Watch the video below to see the new laser module in action. Its creator Nicholas Williams explains a little more. “The laser head is connected to the laser controller with a single Cat 5 cable. This makes it really simple to connect and disconnect the laser head from the Shapeoko. Four M5 bolts are used to attach the head and then it is a matter of simply plunging in a Cat 5 cable. The kickstarter video shows the ShapeOko 2 spindle being swapped with the Laser Ink laser head. The video shown for the swap runs at a 2X speed the actual time to swap the head is still less then 2 Min. As soon as we ship the first unit all hardware designs will be open sourced. This will include 3D models and eagle files for the circuit boards used to manufacture the laser head as well as a BOM that will include sourcing information. We however do not at this time plan to open source the software this may change. For more information on the new Laser Ink module jump over to the Kickstarter website for details and the ability to be one of the first to own the new laser cutting and engraving system. Complete with all the software you need to start laser printing your favourite photos onto different materials.